Mazak machines come as standard with a physical cable network connection. 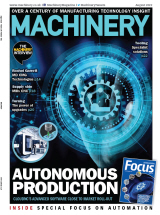 A wired network connection to any IT infrastructure is preferred, says Steve Richardson, software manager at Yamazaki Mazak (https://is.gd/mibule), although where machines are often moved, a standard WiFi box/machine at about £20 can be added for greater convenience. But to capture and make available useful machine data, MT-Connect software hosted within the control is required. MT-Connect (www.mtconnect.org) is an open standard interface offered by many machine tool makers; its genesis is in the USA. It is retrofittable by Mazak engineers to any machine with a Fusion control or later, so from 1998 onwards. But the amount of information gathered is greatest with latest machine models. MT-Connect only transmits information, nothing can be changed in the machine via it, incidentally. To make sense of machine data, Mazak’s Smooth Monitor AX software is required. 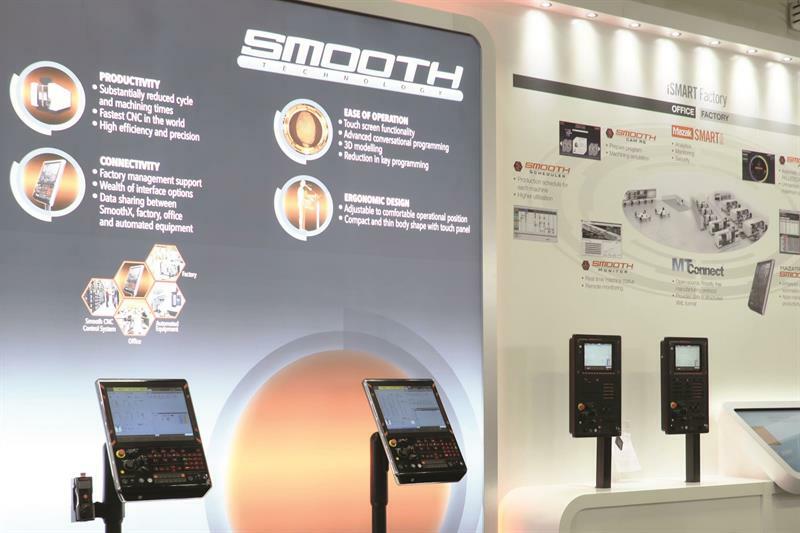 Launched at last September’s EMO exhibition in Germany, customers with the previous version software (Smooth Monitor) can upgrade. This software runs on a web server; any company with a Windows server can install this standard application, should it not already have been set up. Smooth Monitor AX data is viewable on browsers on devices both within and outside the company, via VPN – allowing live data to be discussed at meetings, for example. (Non-Mazak machines can be connected to Smooth Monitor AX, but Mazak has no influence over what data can be captured). Now, it is recommended that machines are connected to a network via Mazak’s SmartBOX, which offers an out-of-the-box, pre-configured firewall capability between network and machine, preventing any virus infection either way – a machine tool’s Windows software will become vulnerable over the years a machine is in place, because it is not updated, as with a company’s PCs. Only one SmartBOX is required for all machines, although groups of machines might have their own to stop, for example, cell-to-cell infection. So, with that set-up, data can be recorded, analysed, interrogated and displayed. Typical data includes: machine powered on (the only condition stipulated in MT-Connect); machine status; alarm state, number and related message; override settings; which program is running; active tool; parts count; axes’ positions; spindle load; and spindle speed. Everybody gets the same data, but in its own iSMART Factory (the UK facility is on the path to this), Mazak does add extra sensors and this is possible for customers on request. That said, extra sensors plus an additional MT-Connect box with output data merged with the standard MT-Connect data stream is also possible, although Smooth Monitor displays only Mazak-nominated data (but stores extra sensor data in the database). Now, all this data is flowing out of the machine, but it is up to the customer as to what he wants to concentrate on. There are a number of standard displays (images, below), and Richardson says that most company’s initially look at machine utilisation. If this shows lower figures than expected, the next stop is an investigation of alarm history. “Within the AX software, it is not only showing alarm history, but also when they happen, allowing you to spot patterns. So maybe you could implement a preventative maintenance programme to eliminate them. It could also highlight training needs where there is an operator element,” he says. Indeed, when Mazak’s US factory installed the software, variations in set-up time between jobs were traced to some operators not changing tools while the machine was in cut as they were unaware this was possible. Assuming that you are getting maximum utilisation, companies might want to increase output from fully employed machines. This can be done by looking at tool utilisation (an option in Smooth Monitor AX), which can identify the most used tools. “You could then talk to your tooling supplier, to see if there is a new product that can improve cutting conditions to shorten cycle times, or a tool with extended life, so reduce the number of change-overs. Spindle load monitoring can be linked to a tool, helping to identify tools that are being underexploited. Outside of that, you can additionally look at which programs you run most often and investigate whether these are optimised [see box item, Supporting Technology],” Richardson offers. Another Smooth Monitor AX option is Energy Dashboard, which additionally requires extra machine sensors (retrofittable). This will identify energy usage and convert this to volumes of CO2. It will also allow energy usage/per program to be analysed. “What some customers are doing is moving their heavy cutting to the night shift, when energy is cheaper,” says Richardson, instancing a Scandinavian example. Looking to the future, Smooth Monitor AX is heading towards being able to take tooling and energy costs and provide cost per part information, although the data is already there for customers to take and use externally to generate this. Imminent in Smooth Monitor AX is a maintenance system that will centralise data and allow quick reference to required tasks. A way to look at Smooth Monitor AX is as a change monitor, Richardson suggests, where existing conditions can be compared to altered conditions and confirm, or otherwise, a benefit. The software directs effort in a data-driven way and provides confirmation of results of change. So, simply speaking, changing a tool to reduce cycle time might not be such a good choice, if the trade-off is more frequent tool replacement that increased downtime, he instances. Mazak itself is treading the iSMART Factory journey in its own facilities around the world (at different paces), applying data analytics to drive better efficiency and productivity in pursuit of a continuously evolving factory supported by autonomous adaptive control with artificial intelligence. But it is clearly possible to derive benefit now. * Smooth Tool Management – This can support programmers in minimising tool variety. This will also support tool presetting and the sending of centrally held offsets to machines. It will also maintain a history of a tool’s usage and remaining life, allowing maximum use of inserts and identifying need for tool replacement or, for example, for a sister tool to allow unattended running. And Smooth Tool Management knows where all tools in use are. *A machine option demonstrating sensors, data and analysis that was unveiled last September at the EMO exhibition in Hanover is Spindle Analytics, shown first on Integrex models’ milling spindles. This looks for harmonic frequencies that could be damaging to the machine and suggests action, such as increasing/decreasing the feed rate, identifying the “sweet spot” for cutting conditions, or, in extreme cases, stopping the machine.